On August 28 at the Okinawa Industry Support Center in Oroku, Naha City, Akmal Abu Hassan of Malaysia Halal Corporation Co., Ltd. shared tips for business expansion in Islamic market. On August 28, the Okinawa Products Associated Co. Ltd launched the Okinawa Halal Chamber to expand business for Okinawan products in the Islamic market in Southeast Asia. The Chamber will hold test marketing of Okinawan products in Malaysia in November and in Singapore in January 2015. The Chamber consists of 19 Okinawan companies and supporting groups made up of food manufacturers. It plans to increase its membership. The board members will be selected at the next meeting in October. The head office is located at the Overseas Project Division of the Okinawa Products Associated Co.
During the first year of the project, the Chamber will conduct research of Islamic markets and conduct study sessions to get certification as a producer of Halal food (cooked and processed according to the law of Islam). Focusing on markets in Malaysia and Singapore, the Chamber will develop “non-pork, non-alcohol” products. The Chamber is planning to sell products from the member companies that get certification as Halal food producers. 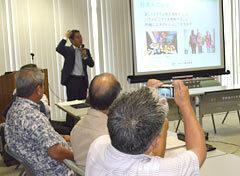 On August 28, the Chamber held its first meeting at the Okinawa Industry Support Center. Akmal Abu Hassan of Malaysia Halal Corporation Co., Ltd. gave a lecture on the theme of “tips for business expansion in Islamic market.” Akmal emphasized the importance of understanding Muslim and Halal business.